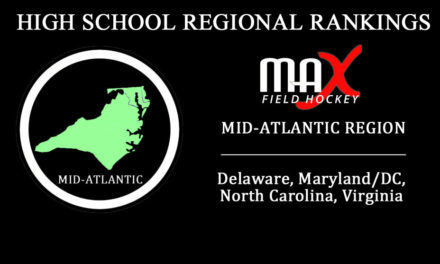 MAX Field Hockey’s Regional Rankings for 2016 have been expanded from a Top 10 to a Top 20! The PA/NJ Region consists of all public and private schools in the states of Pennsylvania and New Jersey. 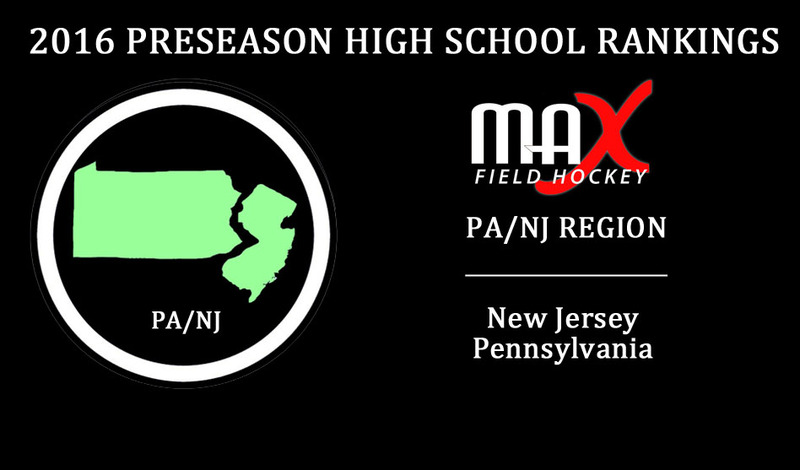 The #1 team in the PA/NJ Region heading into the 2016 season is the defending National Champion, Eastern Regional High School, from Voorhees, New Jersey. 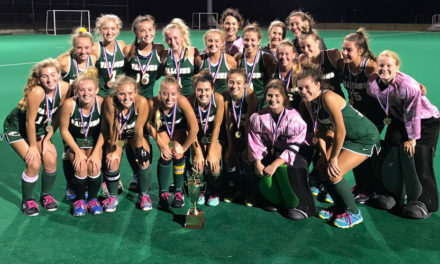 The Vikings remain the most dominant team in High School Field Hockey in the nation and enter 2016 on a 133 game unbeaten streak and winning four straight Tournament of Champions. Despite graduating three All-Americans, including the New Jersey State Player of the Year, Madison Morano, the leading scorer in the state, Nikki Santore (69 goals, 36 assists in 2015), and one of the top defenders in the state, Alanna Gollotto, Danyle Heilig’s Vikings will be ready to prove they are the best there is in High School field hockey each time they step on the field. A team that always reloads, Eastern doesn’t have to look far for their next stars. Alexis Pettisani (1st Team All-American) and Mackenzie Keegan (3rd Team All-American) will be ready to step in and lead the top program in the state. 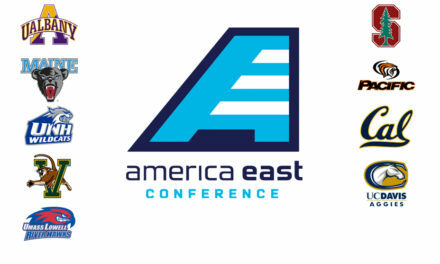 We anticipate Eastern to once again face their strongest competition from #4 Oak Knoll School, a squad that was young in 2015 and returns a lot of the top talent in the state, including 1st Team All-American Ali McCarthy, 2nd Team All-American Gabby Andretta, and all-state goalkeeper Jordan McGinley. 2016 will certainly be an interesting and exciting year for the state of Pennsylvania, especially with the new classifications and adding a third state championship (now AAA, AA and A from just AAA and AA in 2015). We could have drawn from a hat the top handful of teams for these rankings. These teams have so much proven talent, so much young talent, and they are being coached by some of the top coaches in the country- it really may come down to who is better or who gets a break on a given day. Because we had to pick, we had to go with the returning AAA State Champions Emmaus High School for the top PA spot at #2. 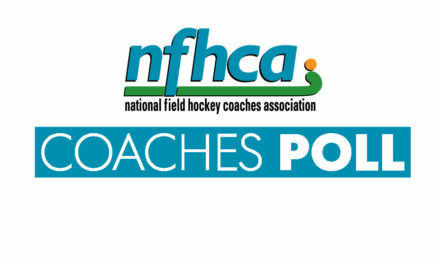 2015 National Coach of the Year Sue Butz-Stavin returns one of, if not the top High School player in the country in 1st Team All-American Meredith Sholder. They will once again be challenged by #3 Palmyra Area High School, the AAA State Runner-Up and 2014 Co-Champions. Kristi Costello graduated two very talented players and leaders in Kiley Gallagher and Erin Huffman, but returns one of the top goalkeepers in the area in Cheyenne Sprecher and all-state players Jessica Dembrowski and Katleyn Mark. #5 Penn Manor High School will be looking to close out the big games in 2016, after falling just short to Emmaus 2-1 in the AAA semifinal and Palmyra in the District 3 AAA final. 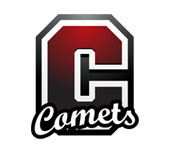 The Comets graduated two all-state players in goalkeeper Allison Schaefer and Emily Robb, but return two of MAX Field Hockey’s Top 5 players and Maryland commits, Brooke and Emma Deberdine. Head Coach Matt Soto will surely have his squad ready to contend for another district and state title. #8 Lower Dauphin High School and #10 Unionville High School are next up for our AAA contenders. Lower Dauphin returns some talented senior leaders in Allison Bitting and Halle O’Neill, and Unionville returns what we believe is hands down the top junior class in the country- Erin Matson, Claire Donovan, Annie McDonough, Madeline McDonough, Katie Anderson and goalkeeper Lizzie Gaebel (all six players were ranked in MAX Field Hockey’s Top 100 players, Matson being the top player in the entire country in that class). Unionville put together a 23-1 2015 campaign and will need to win against the top teams to make that next jump past the state quarterfinals. Our top AA contenders include #6 ranked Donegal High School and #7 ranked Villa Maria Academy. Donegal returns talent at all ends of the field, including one of the top young scorers in the state, Mackenzie Allessie, one of the top midfielders in the state, Rachel Robinson, and one of, if not the best High School goalkeeper, Katie Jean. Donegal doesn’t get tested much in their regular season play, so it will come down to whether they are ready for the higher level competition come post-season where they may face a team like Villa Maria Academy. Villa Maria graduated two of their leaders in Megan Vermeil and Abigail Siana, but return UConn commit Lindsay Dickinson and some of the top young talents in the country, including Adele Iacobucci, Hannah Miller and Mary Harkins. In the #9 spot is Episcopal Academy. The defending PAISAA and Inter-AC Champs have some huge shoes to fill with the graduation of two MAX Field Hockey Top 5 and U21 National Team Players, Margaux Paolino (Duke) and Maddie Bacskai (Prinecton), as well as Courtnie Williamson (UNC). Head Coach Gina Buggy’s squad will have a different look without those standouts, but we still expect them to be the top private school in the state behind players like Corinne Zanolli.